The distance between the outside flanges of end wall columns in opposite end wall is considered the building length. End bay length is the distance from outside of the outer flange of end wall columns of center line of the first interior frame columns. Interior bay length is the distance between the center lines of two adjacent interior main frame columns. The most economical bay length is 6m or 7.5m. However bay length up-to 15m is possible. Building height is the Eave height which usually is the distance from the bottom of the main frame column base plate to the top outer point of the eave strut. Eave heights up-to 30m are possible. When columns are recessed or elevated from finished floor, eave height is the distance from finished floor to top of eave strut. Unless otherwise specified Accumech Building Systems Pvt. 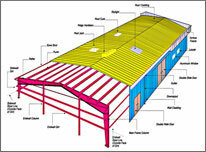 Ltd. Pre-Fab building system are designed for the following minimum loads. 0.75 kN/m2 Design for snow loads, seismic loads, collateral loads, or any other local climatic condition (if required) must be specified at time of quotation. Loads are applied in accordance with the latest American codes and standards applicable to pre-engineered buildings unless otherwise requested at the time of quotation. The most common primary framing systems are shown below. All are shown symmetrical about the ridge line. Framing systems unsymmetrical about the ridge line and multi span framing system with unequal width modules are possible but may require more engineering time and probably longer deliveries. Practically any frame geometry is possible. Consult us for your specific Requirements. PRIMARY FRAMING CONSISTS OF ALL STRUCTURAL ELEMENTS TRANSFERRING LOAD TO THE FOUNDATIONS. Intermediate frames consist of built up welded primary framing members. 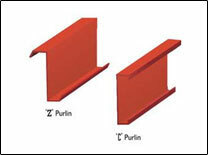 These are either C.R.S.sections, hot-rolled profiles, or built-up welded profiles. Frames are complemented by flange bracing, connection bolts and anchor bolts. Generally, the base of the intermediate frame is pinned. Certain circumstances demand a fixed base approach. All efforts for protection during transportation and erection are made. All profiles receive a shop primer coat of either red or gray color. Optionally, a finished coat also can be provided, on request. Wind bracing provides longitudinal stability for the building. It consists of cross bracing located in the roof and side walls in one or more days depending on loadings and the length of the building. When required, cross bracings can be replaced by wind portal frames or by fixed base wind columns located adjacent and connected to the main frame columns. Secondary framing consists of the elements which support the roof wall sheeting and which transfers loads to the primary frames. Accumech Z- purlins are cold roll framed Z Profiles of 100mm – 300 mm deep formed out of 1mm – 3mm thick steel (245MPa/345MPa); fixed to the rafters of the primary structures. The purlins are usually joined by means of galvanized bolts as per the jointing details mentioned. Accumech Wall grits are cold roll framed in "C" & "Z" shape profiles of 100mm-300mm deep formed out of 1mm-3mm thick steel and connected as per details. For adverse climatic conditions, special corrosion treatment is offered as and when needed. GSM/ 175 GSM and 275 GSM coating as per requirement.